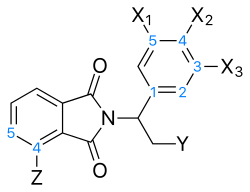 A phosphodiesterase inhibitor is a drug that blocks one or more of the five subtypes of the enzyme phosphodiesterase (PDE), thereby preventing the inactivation of the intracellular second messengers cyclic adenosine monophosphate (cAMP) and cyclic guanosine monophosphate (cGMP) by the respective PDE subtype(s). The different forms or subtypes of phosphodiesterase were initially isolated from rat brains by Uzunov and Weiss in 1972 and were soon afterward shown to be selectively inhibited in the brain and in other tissues by a variety of drugs. The potential for selective phosphodiesterase inhibitors as therapeutic agents was predicted as early as 1977 by Weiss and Hait. This prediction meanwhile has proved to be true in a variety of fields. But different analogues show varying potency at the numerous subtypes, and a wide range of synthetic xanthine derivatives (some nonmethylated) have been developed in the search for compounds with greater selectivity for phosphodiesterase enzyme or adenosine receptor subtypes. Inamrinone, milrinone and Enoximone are used clinically for short-term treatment of cardiac failure. These drugs mimic sympathetic stimulation and increase cardiac output. Cilostazol is used in the treatment of intermittent claudication. Pimobendan is FDA approved for veterinary use in the treatment of heart failure in animals. 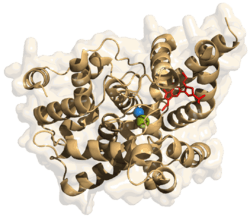 PDE3 is sometimes referred to as cGMP-inhibited phosphodiesterase. Ibudilast, a neuroprotective and bronchodilator drug used mainly in the treatment of asthma and stroke. It inhibits PDE4 to the greatest extent, but also shows significant inhibition of other PDE subtypes, and so acts as a selective PDE4 inhibitor or a non-selective phosphodiesterase inhibitor, depending on the dose. Piclamilast, a more potent inhibitor than rolipram. Luteolin, supplement extracted from peanuts that also possesses IGF-1 properties. Apremilast, used to treat psoriasis and psoriatic arthritis. PDE4 is the major cAMP-metabolizing enzyme found in inflammatory and immune cells. PDE4 inhibitors have proven potential as anti-inflammatory drugs, especially in inflammatory pulmonary diseases such as asthma, COPD, and rhinitis. They suppress the release of cytokines and other inflammatory signals, and inhibit the production of reactive oxygen species. PDE4 inhibitors may have antidepressive effects and have also recently been proposed for use as antipsychotics. On October 26, 2009, The University of Pennsylvania reported that researchers at their institution had discovered a link between elevated levels of PDE4 (and therefore decreased levels of cAMP) in sleep deprived mice. Treatment with a PDE4 inhibitor raised the deficient cAMP levels and restored some functionality to Hippocampus-based memory functions. Sildenafil, tadalafil, vardenafil, and the newer udenafil and avanafil selectively inhibit PDE5, which is cGMP-specific and responsible for the degradation of cGMP in the corpus cavernosum. These phosphodiesterase inhibitors are used primarily as remedies for erectile dysfunction, as well as having some other medical applications such as treatment of pulmonary hypertension. Dipyridamole also inhibits PDE5. This results in added benefit when given together with NO or statins. Claimed newer and more-selective inhibitors are icariin, an active component of Epimedium grandiflorum, and possibly 4-Methylpiperazine and Pyrazolo Pyrimidin-7-1, components of the lichen Xanthoparmelia scabrosa. Recent studies have shown Quinazoline type PDE7 inhibitor to be potent anti-inflammatory and neuroprotective agents. Papaverine, an opium alkaloid, has been reported to act as a PDE10 inhibitor. PDE10A is almost exclusively expressed in the striatum and subsequent increase in cAMP and cGMP after PDE10A inhibition (e.g. by papaverine) is "a novel therapeutic avenue in the discovery of antipsychotics". ↑ Uzunov P.; Weiss B. (1972). "Separation of multiple molecular forms of cyclic adenosine 3',5'-monophosphate phosphodiesterase in rat cerebellum by polyacrylamide gel electrophoresis". Biochim. Biophys. Acta. 284: 220–226. doi:10.1016/0005-2744(72)90060-5. PMID 4342220. ↑ Weiss B (1975). "Differential activation and inhibition of the multiple forms of cyclic nucleotide phosphodiesterase". Adv. Cycl. Nucl. Res. 5: 195–211. ↑ Fertel, R. and Weiss, B.: Properties and drug responsiveness of cyclic nucleotide phosphodiesterases of rat lung" Mol. Pharmacol 12:678-687, 1976. ↑ Weiss B.; Hait W.N. (1977). "Selective cyclic nucleotide phosphodiesterase inhibitors as potential therapeutic agents". Annu. Rev. Pharmacol. Toxicol. 17: 441–477. doi:10.1146/annurev.pa.17.040177.002301. PMID 17360. 1 2 Essayan DM. (2001). "Cyclic nucleotide phosphodiesterases.". The Journal of Allergy and Clinical Immunology. 108 (5): 671–80. doi:10.1067/mai.2001.119555. PMID 11692087. 1 2 Deree J, Martins JO, Melbostad H, Loomis WH, Coimbra R (2008). "Insights into the Regulation of TNF-α Production in Human Mononuclear Cells: The Effects of Non-Specific Phosphodiesterase Inhibition". Clinics (Sao Paulo). 63 (3): 321–8. doi:10.1590/S1807-59322008000300006. PMC 2664230 . PMID 18568240. ↑ Marques LJ, Zheng L, Poulakis N, Guzman J, Costabel U (February 1999). "Pentoxifylline inhibits TNF-alpha production from human alveolar macrophages". Am. J. Respir. Crit. Care Med. 159 (2): 508–11. doi:10.1164/ajrccm.159.2.9804085. PMID 9927365. ↑ Daly JW, Jacobson KA, Ukena D (1987). "Adenosine receptors: development of selective agonists and antagonists". Prog Clin Biol Res. 230 (1): 41–63. PMID 3588607. ↑ MacCorquodale, DW (July 1929). "THE SYNTHESIS OF SOME ALKYLXANTHINES". Journal of the American Chemical Society. 51 (7): 2245–2251. doi:10.1021/ja01382a042. ↑ WO patent 1985002540, Sunshine A, Laska EM, Siegel CE, "ANALGESIC AND ANTI-INFLAMMATORY COMPOSITIONS COMPRISING XANTHINES AND METHODS OF USING SAME", granted 1989-03-22 , assigned to RICHARDSON-VICKS, INC.
↑ Daly JW, Padgett WL, Shamim MT (July 1986). "Analogues of caffeine and theophylline: effect of structural alterations on affinity at adenosine receptors". Journal of Medicinal Chemistry. 29 (7): 1305–8. doi:10.1021/jm00157a035. PMID 3806581. ↑ Daly JW, Jacobson KA, Ukena D (1987). "Adenosine receptors: development of selective agonists and antagonists". Progress in Clinical and Biological Research. 230: 41–63. PMID 3588607. ↑ Choi OH, Shamim MT, Padgett WL, Daly JW (1988). "Caffeine and theophylline analogues: correlation of behavioral effects with activity as adenosine receptor antagonists and as phosphodiesterase inhibitors". Life Sciences. 43 (5): 387–98. doi:10.1016/0024-3205(88)90517-6. PMID 2456442. ↑ Shamim MT, Ukena D, Padgett WL, Daly JW (June 1989). "Effects of 8-phenyl and 8-cycloalkyl substituents on the activity of mono-, di-, and trisubstituted alkylxanthines with substitution at the 1-, 3-, and 7-positions". Journal of Medicinal Chemistry. 32 (6): 1231–7. doi:10.1021/jm00126a014. PMID 2724296. ↑ Daly JW, Hide I, Müller CE, Shamim M (1991). "Caffeine analogs: structure-activity relationships at adenosine receptors". Pharmacology. 42 (6): 309–21. doi:10.1159/000138813. PMID 1658821. ↑ Ukena D, Schudt C, Sybrecht GW (February 1993). "Adenosine receptor-blocking xanthines as inhibitors of phosphodiesterase isozymes". Biochemical Pharmacology. 45 (4): 847–51. doi:10.1016/0006-2952(93)90168-V. PMID 7680859. ↑ Daly JW (July 2000). "Alkylxanthines as research tools". Journal of the Autonomic Nervous System. 81 (1–3): 44–52. doi:10.1016/S0165-1838(00)00110-7. PMID 10869699. ↑ Daly JW (August 2007). "Caffeine analogs: biomedical impact". Cellular and Molecular Life Sciences : CMLS. 64 (16): 2153–69. doi:10.1007/s00018-007-7051-9. PMID 17514358. ↑ González MP, Terán C, Teijeira M (May 2008). "Search for new antagonist ligands for adenosine receptors from QSAR point of view. How close are we?". Medicinal Research Reviews. 28 (3): 329–71. doi:10.1002/med.20108. PMID 17668454. ↑ Baraldi PG, Tabrizi MA, Gessi S, Borea PA (January 2008). "Adenosine receptor antagonists: translating medicinal chemistry and pharmacology into clinical utility". Chemical Reviews. 108 (1): 238–63. doi:10.1021/cr0682195. PMID 18181659. ↑ Lim YH, Lee YY, Kim JH, Shin J, Lee JU, Kim KS, Kim SK, Kim JH, Lim HK (2010). "Development of acute myocardial infarction in a young female patient with essential thrombocythemia treated with anagrelide: a case report". Korean J Hematol. 45: 136–8. doi:10.5045/kjh.2010.45.2.136. PMC 2983030 . PMID 21120194. ↑ de Visser YP, Walther FJ, Laghmani EH, van Wijngaarden S, Nieuwland K, Wagenaar GT (2008). "Phosphodiesterase-4 inhibition attenuates pulmonary inflammation in neonatal lung injury". Eur Respir J. 31 (3): 633–644. doi:10.1183/09031936.00071307. PMID 18094015. ↑ Yu MC, Chen JH, Lai CY, Han CY, Ko WC (2009). "Luteolin, a non-selective competitive inhibitor of phosphodiesterases 1-5, displaced [(3)H]-rolipram from high-affinity rolipram binding sites and reversed xylazine/ketamine-induced anesthesia". Eur J Pharmacol. 627 (1–3): 269–75. doi:10.1016/j.ejphar.2009.10.031. PMID 19853596. ↑ Bobon D, Breulet M, Gerard-Vandenhove MA, Guiot-Goffioul F, Plomteux G, Sastre-y-Hernandez M, Schratzer M, Troisfontaines B, von Frenckell R, Wachtel H (1988). "Is phosphodiesterase inhibition a new mechanism of antidepressant action? A double blind double-dummy study between rolipram and desipramine in hospitalized major and/or endogenous depressives". Eur Arch Psychiatry Neurol Sci. 238 (1): 2–6. doi:10.1007/BF00381071. PMID 3063534. ↑ Maxwell CR, Kanes SJ, Abel T, Siegel SJ (2004). "Phosphodiesterase inhibitors: a novel mechanism for receptor-independent antipsychotic medications". Neuroscience. 129 (1): 101–7. doi:10.1016/j.neuroscience.2004.07.038. PMID 15489033. ↑ Kanes SJ, Tokarczyk J, Siegel SJ, Bilker W, Abel T, Kelly MP (2006). "Rolipram: A specific phosphodiesterase 4 inhibitor with potential antipsychotic activity". Neuroscience. 144 (1): 239–46. doi:10.1016/j.neuroscience.2006.09.026. PMC 3313447 . PMID 17081698. ↑ Vecsey CG, Baillie GS, Jaganath D, Havekes R, Daniels A, Wimmer M, Huang T, Brown KM, Li XY, Descalzi G, Kim SS, Chen T, Shang YZ, Zhuo M, Houslay MD, Abel T (2009). "Sleep deprivation impairs cAMP signaling in the hippocampus". Nature. 461 (7267): 1122–1125. doi:10.1038/nature08488. PMC 2783639 . PMID 19847264. ↑ Redondo, M.; Zarruk, JG. ; Ceballos, P.; Pérez, DI. ; Pérez, C.; Perez-Castillo, A.; Moro, MA. ; Brea, J.; et al. (Jan 2012). "Neuroprotective efficacy of quinazoline type phosphodiesterase 7 inhibitors in cellular cultures and experimental stroke model". Eur J Med Chem. 47 (1): 175–85. doi:10.1016/j.ejmech.2011.10.040. PMID 22100138. ↑ Weber M, Breier M, Ko D, Thangaraj N, Marzan DE, Swerdlow NR (May 2009). "Evaluating the antipsychotic profile of the preferential PDE10A inhibitor, papaverine". Psychopharmacology (Berl.). 203: 723–35. doi:10.1007/s00213-008-1419-x. PMC 2748940 . PMID 19066855. ↑ "Papaverine - induced inhibition of phosphodiesterase activity in various mammalian tissues". Life Sciences. 10: 133–144. doi:10.1016/0024-3205(71)90086-5.